In stock 322 pc. Also available in our walk-in store. Jerry German is smart: he doesn't flail his hands around like a Theremin player on speed, but wears a mosquito net to keep bugs out of his face. Jerry German is smart. Be like Jerry German. 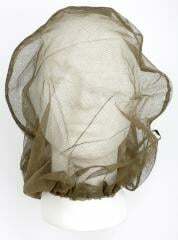 Bundeswehr issue mosquito net, to be worn over the head, secured and tightened with a draw string. Dense eyes to keep bugs out, yet doesn't hinder your vision. Wear with a boonie hat for best effect and to keep the net out of your face as well. The net is incredibly light to begin with, but it can make your backpack even lighter: leave the inflatable pillow at home and stuff some clothes in this mosquito net when you want to rest your head. I bought two of those. First one barely covered my nose, second one was bigger and extended to my chin, and I was not wearing any headgear at the time. If I would want to wear a hat which is essential for mosquito net to be effective , those nets would probably just cover my eyes. So either I suffer from un-diagnosed gigantism of the head, or the average German has a head the size of an apple, or those nets were washed and shrunk making them completely useless. Btw. the third picture shows different net then those supplied. The nets are green not black which is the preferred color to maximize visibility. Tää on vähän kuin vetäisi päähän muovipussin - ilman hapenpuutteen tuomaa euforiaa. Kiristysnarun karatessa nauhakujan sisään kesken pimeimmän yön sitä toivoo että olisi säästänyt jossain muussa kuin tässä. Varustepussiksi ihan ok - jos tykkää kalmanhajuisesta pornosukkahousunpätkästä mikä ei pidä kamoja kuivana kuten esim. minigrip. Mine is barely usable sizewise. Too short and to small diameter for use with a hat. Mine was quite small upon arrival. I put my fist in it for a second and gave a yank which stretched it plenty and simply. This fit over my head fine and seems to want to secure just beneath my collar, or at the shoulders. For the price, I will say it's worthy of 5 stars.